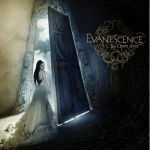 Evanescence are showing their scars on The Open Door, but it's not just through the usual lyrical outputs. People say Daredevil was a bad movie, but it did bring us one thing: Little Rock, Arkansas, band Evanescence, who, unlike Lacuna Coil and Theatre of Tragedy before them, succeeded in bringing gothic female-fronted rock to the mainstream. The stellar Fallen followed, based mostly on Ben Moody's gloomy songwriting and Amy Lee's knack for pretty harmonies. …It's been a long time since then, bar a few exemplary songs in the meantime: "Missing", "Breathe No More", and an effectively bitter cover of Korn's "Thoughtless". But this time there's no Hollywood blockbuster to promote them or their new album to the masses, so this has left a now Ben Moody-less Evanescence to rely solely on Lee's ability to scrape up. "I won't be held down / By who I used to be", she declares on "Weight of the World", yet mostly fails to back that claim on The Open Door -- far too often, these fourteen songs seem to turn to her breakup with Sean Morgan of Seether and/or the departure of Moody to carry the weight. While the disc may stutter uncertainly with hits and misses, "Sweet Sacrifice" is sure to become a future hit for the group -- though their female fronter does sound strained on some spine-tingling high notes, ex-Cold replacement guitarist Terry Balsamo provides the excellently dark arrangements it needs to keep its head above the water. Unfortunately, things take a downhill slide from there -- the 'revenge song' "Call Me When You're Sober" reduces their dramatic image to a state of mope Kelly Clarkson breakup pop for mileage, and The Open Door itself quickly mutates into a sea of washy, bland, and overlong ballads to fit its supposed status quo. Those with appreciation for classical music will no doubt be shocked when they hear that the quartet has committed their greatest musical crime yet by sampling Mozart in "Lachrymosa". It works in the way sampling The Police's "Every Breath You Take" did in that Puff Daddy tribute to the Notorious B.I.G. -- that is, just barely -- but Lee decides to spoil the moment by mewing over the top, and then daring to bring in a choir to chorus with her. Apart from '"Like You", which relies predictably on piano for emotional impact, each morbid number seems to be a rehash of the one before it -- this includes "Lose Control", "Your Star", "Lithium", etc., and sacrifices brief glimpses of their vocallist's heartache by reeling out either a deathly boring loud-soft structure, or a painstaking buildup. In this sense, all the organs, choirs, strings, and an odd xylophone ("Snow White Queen") are rendered completely useless. Luckily, "All That I'm Living For" has the decency to have something that resembles backbone, something missing too frequently from The Open Door, to wake listeners up prior to its conclusion. If the album serves any particular purpose, in fact, it's to highlight the shortcomings of Amy Lee without her former bandmate. She moans, mourns, and weeps, and manages to utter some vague form or implication of 'if you really loved me' at least some twenty times throughout, yet never really carries the disc or owns our hearts like she did on Fallen. But though the lyrics may be permanently cliché, The Open Door is not a sophomore slump -- the overall flow is pretty good, and the instruments put to use are still much more creative than many popular rock bands out there. It's just not truly adequate for the standard the band set for themselves with their debut outing. And there's plenty more capable female-led gothic-rockers out there who can top this, if you're willing to look outside the immediate mainstream picture.